You are here » frostvalley.org » Overnight Camp » What key is most difficult to turn? What key is most difficult to turn? This week we have introduced Specialties. This is where the girls get to decide whether they carry on with their arena lessons, or learn about how to ride trail rides! We have 5 trails at EVR, and each get more difficult, but we believe our cowgirls can handle it! Last night the 2 weekers went out on their overnight! We set out on our overnights to sleep under the stars! Yurts 1 and 2 slept outside the barn at East Valley Ranch, and they all found it really exiting to sleep where the horses live during the day and listen to the sound of some of the horses walking around in the back paddock behind the barn at night to fall asleep to. For yurts 3 and 5, we walked a 45 minute hike to the farm, crossed the cable bridge, and set up camp for the night in the woods under tarps. We had a campfire and sang songs and roasted marshmallows. We fell asleep to the sound of the stream running past us and the frogs croaking in the distance. I think the most talked about part was that they had to use nature as their restroom! A fun evening was had by all. Tonight we have our Staff Demo. This is where the girls get to watch our staff ride the horses, and they have a competition called transitions. Someone shouts commands such as walk, trot, canter, circle, and the last horse and rider to do that command, is out. The girls love cheering for their counsellors to win. The staff also get very competitive, and so like to do barrel racing and pole bending. Something else that is very exciting is that our little sister village- Mustang, are coming to watch too! They are also doing their overnight at EVR tonight, which gives them an opportunity to see how great EVR is as it is the next stage up for them! Donkey and Skillet are our father and son duo at EVR. Donkey was here first and then Skillet was born at the Farm. Skillet is just beginning his training and today the 4 weekers helped our Equestrian assistant director Quain, to get comfortable with a bit in his mouth. They learned about the steps to take in a young horses life to get them prepared to start riding. 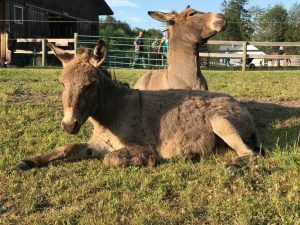 But as Donkey and Skillet are both donkeys, they will not be in regular lesson rotations. We hope that they will be pack donkeys. They will carry packs of supplies on trails and overnights. Skillet and Donkey are an excellent addition to our EVR herd.